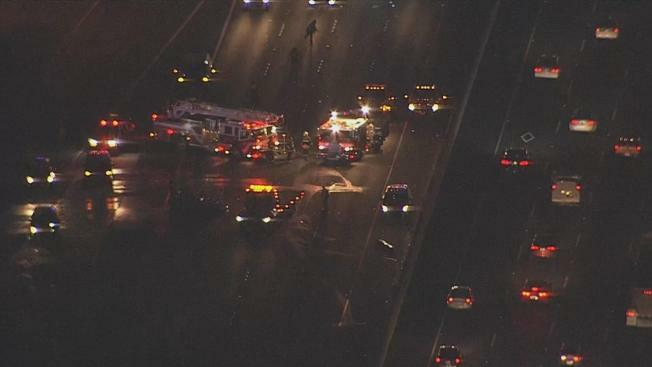 A rear-end collision led to a car fire on Interstate 880 in Milpitas early Thursday and left one man, who was hauled out of the burning vehicle by at least three drivers, with major injuries, according to the California Highway Patrol. The collision was reported on northbound I-880 south of State Route 237 around 5:30 a.m., CHP Officer Ross Lee said. Initial reports indicated there were 10 cars involved, but further investigation showed the driver of a Ford F-350 rear-ended a Nissan sedan that burst into flames, Lee said. Multiple motorists passing by pulled over to help, including three people who reached into the Nissan and pulled the driver out of the burning car's window. The driver was transported to Santa Clara Valley Medical Center in San Jose for severe burns and broken ribs, Lee said. One of the rescuers suffered minor burns and smoke inhalation, according to Lee. The Ford driver told investigators that he glanced down for a moment while behind the wheel and looked up to see two red taillights. The Ford driver wasn't sure if the vehicle ahead of him stopped or was slowly coming to a stop, and he ended up hitting the Nissan at full speed, Lee said. Officers are looking into whether the rear-end collision was related to a prior call of a car stalled in lanes in the area, according to Lee. A Sig-alert was issued at 5:40 a.m. blocking all northbound lanes until about 7:30 a.m., CHP officials said.